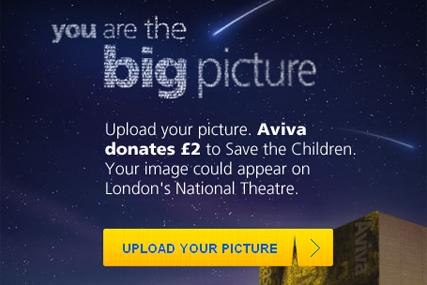 Aviva, the insurance giant, is today (18 September) launching the second phase of its 'You Are The Big Picture' campaign. The campaign, first rolled out in 2010, features giant images of consumers being displayed at prominent outdoor sites in metropolitan areas. Once again, people will be able to upload photos and messages through Aviva’s Facebook page. For every upload, the brand will donate £2 to the international Street to School programme run by the charity Save the Children – double the donation the company made last year. The aim of the initiative is to provide education and counselling to 2,000 children a year in India, through the financing of two mobile learning centres. Each photo and message will be combined to create a montage in the shape of a face, aimed at reinforcing Aviva’s image as a brand that sees its customers as individuals. Some of these personalised collages will be projected on the National Theatre’s Lyttelton fly tower and will be available on YouTube. Aviva is also targeting "influencers" with ads in Charles de Gaulle Airport in Paris and London City Airport. Amanda Mackenzie, Aviva's chief marketing and communication officer, said the campaign backed up the brand’s 'No one recognises you like Aviva' global strategy. She said: "By treating our customers as individuals, listening to their needs and engaging with them, we can connect with them more powerfully. The equation is simple – get it right for our customers and the business will benefit too." Last year, Aviva’s Facebook page received two million visits, while in excess of £150,000 was donated to Save the Children.